On Saturday, April 6th, 2019 Stevenson Middle School attended the regional SeaPerch competition at the Great Lakes Naval Base. SeaPerch is an underwater robotics program that teaches students about robotics, engineering, science, and mathematics (STEM) while building an underwater ROV. Four teams attended the competition which included an obstacle course and a cave rescue mission. The Land Sharks placed overall first for the middle school division. 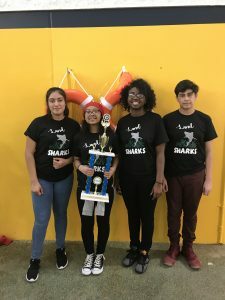 Team members include Shantiah W., Dylan C., Mayra O., Deanna D., and Trisha T. The Land Sharks will compete at the National SeaPerch competition on June 2nd at the University of Maryland. Congratulations to all the team members for sporting good fellowship throughout the competition.